In Australia, the harsh sun and drought periods can cause or contribute to the browning of a lawn. 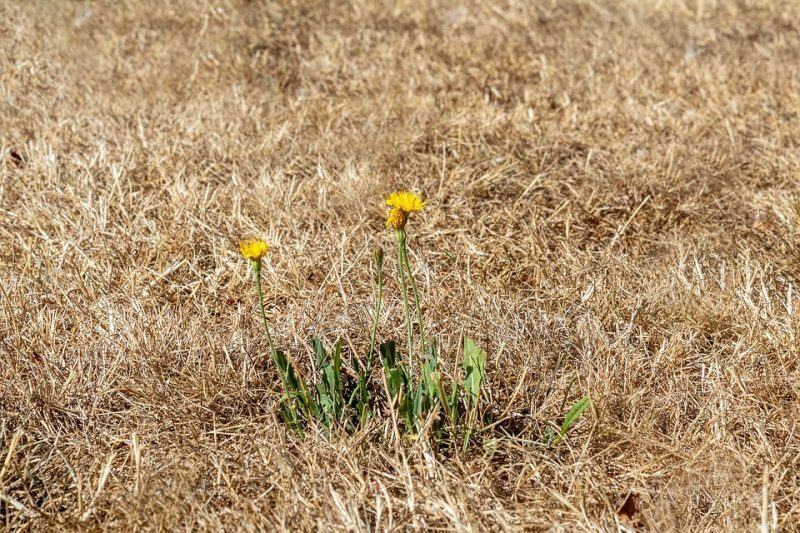 Many places may be put on water restrictions during times of drought, meaning the time of day you are allowed to water your lawn can be restricted, or lawn-watering is banned entirely. Most people choose warm season grasses for lawns in Australia, and these variations tend to be more resistant to drought. Try not to worry too much if your grass is looking less-than-stellar during the summer. It’s normal for lawns to go dormant during periods of reduced rain, and it should spring back once rain returns. If you see your lawn turning brown due to the heat, don’t over-water it to compensate. Watering your lawn too frequently, meaning everyday or every other day can actually be bad for the turf, as water can restrict air to the root system. Watering once or twice a week during the summer (if water restrictions allow) should be plenty to keep your lawn in good shape. Weeds can be a nuisance in any area of the garden, and the lawn is no exception. From dandelions to clover patches to annoying prickly bindiis, weeds can creep their way into your yard and take over right before your eyes! If you want to avoid your lawn being smothered by weeds, dig out any you see early on, before they expand. It’s also important to ensure you cover any bare patches with either grass seed or turf, as weeds are opportunistic and will take any chance to move in. Mowing grass too low can put large amounts of stress on a lawn. This method, often referred to as ‘scalping’, involves cutting the lawn down to about an inch or two in length, and is often done in the hope that doing so will lead to less-frequent mowing. The issue with cutting a lawn low is that often the crowns of the grass will be injured, which then leads to a weakened turf, susceptible to diseases and weeds. The longer (within reason) you can stand to cut your lawn the better, and somewhere around the three-inch mark can be good for hotter months. Longer lengths also offer further protection against the elements and more photosynthesis. If you own a dog and notice small brown patches on your lawn, it could be caused by your pooch’s urine. Dog urine contains high levels of nitrogen which can be damaging to grass. If you see your pet go to the bathroom on a spot in your yard, water the area immediately, or flush it with a bucket of water. Reducing the concentration of nitrogen should help your lawn to avoid being scalded.